Ha! You weren’t supposed to open the launch pack before the 14th! 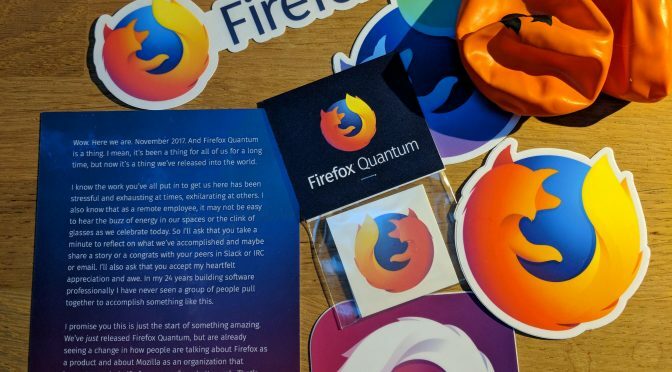 It was written on the “Firefox Quantum” sticker on the enveloppe I received. OTOH, the customs form listed “Thank you card” and “Balloons”, so it was already spoiled before opening. Thank you for your work. I’ve been using FF57 for a while now and it’s be very fast and very stable. This is a great achievement on its own, and even more impressive that it was done on a moving target (no big stop and rewrite of FF). It’s nice to see in a Mozilla employees own words how totally detached they are from the users of their browser. Yes congratulations on the release of your new browser version that’s pushed me and thousands of others away from any Mozilla products for good. I’ve used Mozilla since before Firefox existed. I’m done now. They no longer produce anything that suits my needs. Graw: I’m afraid you can’t find any current browser that has stopped development and still offers a good experience. Whatever browser you choose to use, you will notice that it too will change over time. If Firefox 57 showed a picture of Hitler and nothing else, you could still use the same argument to refute criticism. I want to say thank you, on behalf of the other half that had stopped using Firefox and are now picking it up again :). The active fork of a much older version of Firefox seems to work just fine and the developers moving their plugins over from Firefox seem to agree. Sure change is fine unless it’s a change that removes the only reason people use your product over other ones. I’ve also used Firefox since before it was Firefox, and I love 57. Mozilla is doing their best work yet. Thanks Daniel! Release is next week?! Already?! Damn! Looking forward to it! Quantum Beta has finally given me a reason to abandon Chrome. I’ve even been recommending Quantum to all my friends and everyone’s been impressed. Good luck! Thanks for this posting, Daniel. I’m looking forward to it and very tempted to update from my current 56.0 version. However, seems one of my fave add-on’s: Roomy Bookmarks (https://addons.mozilla.org/en-US/firefox/addon/roomy-bookmarks-toolbar/) won’t work due to “legacy” status. Boo-hoo! Excited for the new release. Glad Firefox is still going. And getting a much needed shot into arm to catch up to the current state of the art. I loved FF back in its heyday, and would love to come back. This release promises to finally get stability and memory management under control. Now just get syncing right, and make side tabs and tab memory management native, and I’ll be able to ditch Chrome. … one of the add-ons I’ve been using is not available (yet) – this one GreaseMonkey has alternatives and although one of them is working it is not completely working. I also rather would have used GreaseMonkey and plan to go back as soon as it is available as a stable version. Most other plugins I’ve been using are not really missed by me at the moment, but the fact that a popular add-on is not available is still a disappointment to me. Why? I’ll try to explain. The focus related to the new add-on logic (i.e. WebExtensions) was primarily feature-parity with Google Chrome. This makes sense, as WebExtensions should be “compatible” with the Google Chrome add-ons. Until this point there is no problem, however as soon as the first indication is given that Fx 57 will be dropping the classic XUL/XPCOM add-ons the a communication problem starts. This is related to no clear sign that Mozilla is actively investigating themselves what features are in the top 50, 25 or event top 10 add-ons. In the communication from Mozilla employees/project leaders all that is said is: “”Please file bugs for missing features.”” – In my opinion Mozilla should have done this investigation themselves And(!) work on a plan to get the features of the top 10 (or event better top 25 or top 50) add-ons in WebExtensions. This is disappointing to me as this is something which is possible with static analysis (at least IMHO) due to the static nature of XPCOM. Providing the functionality as a WebExtension feature is not magically converting the classic add-ons, but it makes the work of the add-on developers easier as they do not have to chase the required API’s, they just have to use them. Also the fact that the planning is not done around an ESR release is strange – indicating this as an alternative release plan in comments to other posts seems to be ignored (in theory it is still possible to create an Fx 56 ESR and support this for another year or so – I’ve indicated this to other posts and somehow this is ignored as well). I could go on, but the point is that Mozilla underestimates the fact that power users use lots of add-ons, which should be available in a WebExtension-edition before pulling the plug on the classic XPCOM architecture. The same power users are most of the times also advocates for Firefox as a browser, alienating them is a disaster from a PR point of view… Somehow this is not understood it seems. I have the same sentiment as Ethan: Although I did enjoy the more powerful Firefox extensions that were enabled by the old system, Chrome’s speed drew me toward it once it gained its own extension system. The major extension I’m sad to leave behind on Firefox is NoScript, which to my understanding cannot do what it does with the WebExtensions API; the closest thing that may work is uMatrix, even though its AMO page does not currently say it will be compatible with Firefox 57, because I do know it’s based on a Chrome extension. I remember trying out Firefox 56 and being a little impressed, but not enough to switch back from Chrome, and I may switch back with Firefox 57. As far as I know Mozilla is working together with Giorgio Maone to get the required features in Fx so that NoScript can work. Of course it would have been better that this was already available and this is exactly the objection I have related to the planning regarding Fx 57. The planning should have been to get WebExtensions to a proper featureset (i.e. the features of the actual and actively developed top-25 add-ons) before killing the classic (and much more powerful) XPCOM/XUL based add-on features…. 17 of the top 25 add-ons are already compatible with Firefox 57 and on AMO. NoScript will be released soon for Firefox 57 (so 18), Firebug was directly integrated into Firefox and is no longer developed (up to 19), and DownThemAll in the in process of being ported to WebExtensions (so that will be up to 20). As for the remaining 5, you’ll have to ask the add-on authors where they’re up to. This version won’t support a majority of my add-ons, and from the sound of it, will never be able to support them, so I’ve uninstalled Firefox and switched to Waterfox, which will continue to support legacy add-ons. So long, Firefox; it was nice while it lasted. Too bad what your new management did to you. I totally understand the benefits of Quantum, but Mozilla seem to have forgotten how important extensions are to users. It seems to have been scheduled at the time that was most convenient to Mozilla, not the time that made most sense for the ecosystem. 1) Last year’s push to make extensions multi-process compatible. This was a waste of extension writer’s good will. The push should have been for them to convert to Web Extensions. 2) Too little attention paid to the upgrade experience of users with legacy add ons. A smooth upgrade experience, including replacing obsolete add ons with similar equivalents, should have been a blocker for release. There should have been “AreAddonsReadyYet.com” to track which adds ons had been upgraded or had a suitable replacement. Quantum should have been held until a certain percentage of the most used add ons were ready. 3) Quantum should have been released immediately after an ESR. I’m currently on Firefox 56 and now have the choice of going back 4 releases or losing essential addons. Will my Firefox 56 profile even work in Firefox 52 ESR? Do not want quantum, it changed everything I was familiar with. Now I have to figure out how to restore that which was lost. It should have been a clear option instead it was just initialized. Waterfox! Man, you made my day. Despite updates are set to be confirmed before installation, quantum was installed without notification, and work critical extensions are gone. I used FF since the days of the application suite, but to take command out of my hands is too much.